But for me there is a problem. I used to own half a dozen alt-az mounts like the TelePod; now I own precisely none. The reason is that I had a kind of epiphany one night, out on my balcony, trying to get a good view of Mars with an alt-az mounted refractor. What I realised was that for the kind of viewing I do alt-az mounts are a pain. At low powers they’re great, but at high-powers you are forever pushing the mount around trying to get that planet back in view. 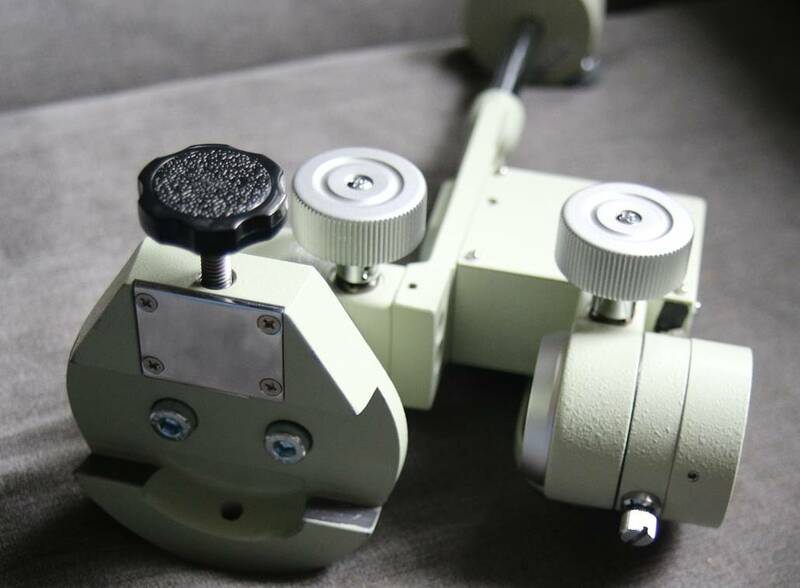 What’s needed, of course, is an equatorial mount: just a simple one with a driven RA axis to follow the sky and some smooth manual slow-motion controls for fine adjustments. No problem! There are loads of those around. But now what if I want that one-hand grab-n-go portability as well? Just about the only mount that fits the bill is Takahashi’s Teegul Sky Patrol. The Teegul SP has been around for a long time, but has been revised in recent years to make it easier to use. 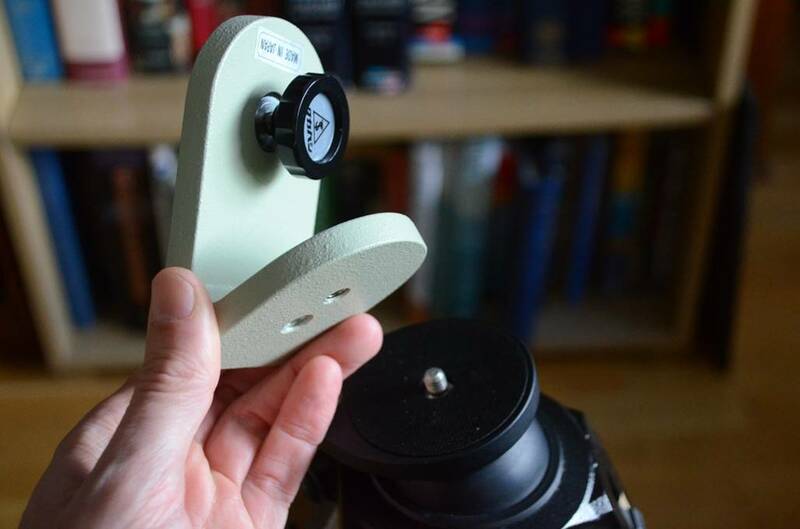 It’s tiny and very light (about 2Kg for the basic set), but also breaks down into very small chunks for travel, making a perfect eclipse-chasers’ mount. I don’t do many mount reviews, but the Teegul is worth it if only because there seems to be some confusion as to how it’s actually meant to work (the guy I bought mine from clearly didn’t get it at all and had given up with the mount unused); it also has a lot of options and is arguably a bit too clever for its own good. I’ll try to get to the bottom of all that here. The first thing to understand about the Teegul is that it isn’t one mount, it’s (at least) three, all of which have quite different configurations using the Teegul components (and some extra accessories) put together in different ways. The key to this lies in the fact that the RA and DEC components are separable, locking together with tiny set screws. (Don’t understand? Trust me, it’s easier to look at the photos). I’ll describe these three possible configurations separately below. Most promotional photos of the Teegul show it in this configuration and this is how the SP3 is supplied in its most basic form, if you don’t buy the counterweight set. It’s a slightly tricky arrangement, but is easy enough to setup once you realise it’s not a German Equatorial!! This configuration only works for the shortest OTAs (i.e. the FS-60) and even then won’t give you coverage of the whole sky because the focuser interferes with the RA housing (see photo below). It does have the advantage of being very solid and compact, though, and is perhaps the ideal eclipse-imaging configuration. I’ll say it again: it’s not a German Equatorial! You have to disassemble it and put it back together in a different configuration to make it into one (see below)! It’s easier to look at the photos than read an explanation of how it goes together. When I first got it, this had me scratching my head; the previous owner clearly never got past that stage! The V adapter (shown in all the photos) is a fixed 45 degree wedge that fixes to the top of a photo tripod and the bottom of the mount. This is quite a neat accessory that also makes a cheap, light wedge for a Questar! 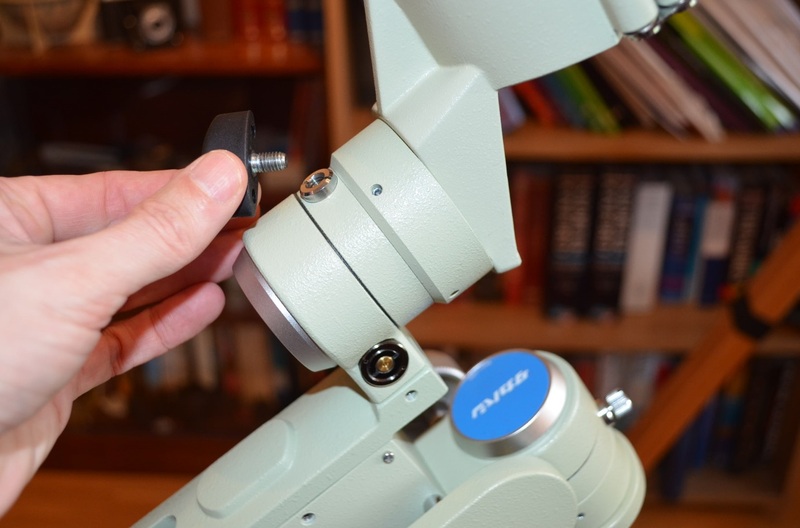 The adapter head is just a pivoting elbow held by a single screw that bolts to a photo tripod. It will adjust for any latitude, but doesn’t look very safe or stable; I haven’t tried it. 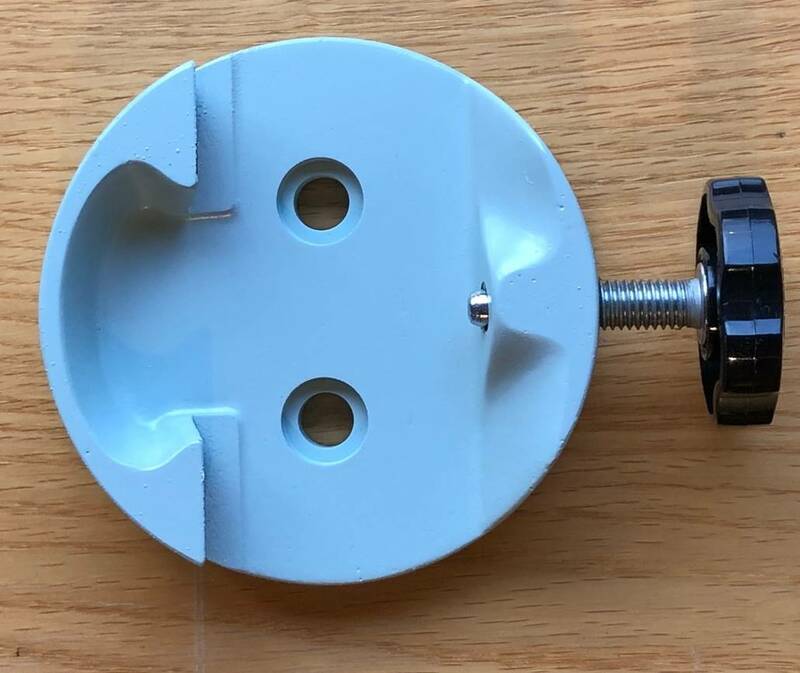 Pretty obviously, the V plate alone isn’t going to work unless you live in southern Europe or the central US, but there is a way around this that I’ve used here: buy a tripod with a locking ball head; the combination will give you precise latitude adjustment, but with the solidity of the V plate! 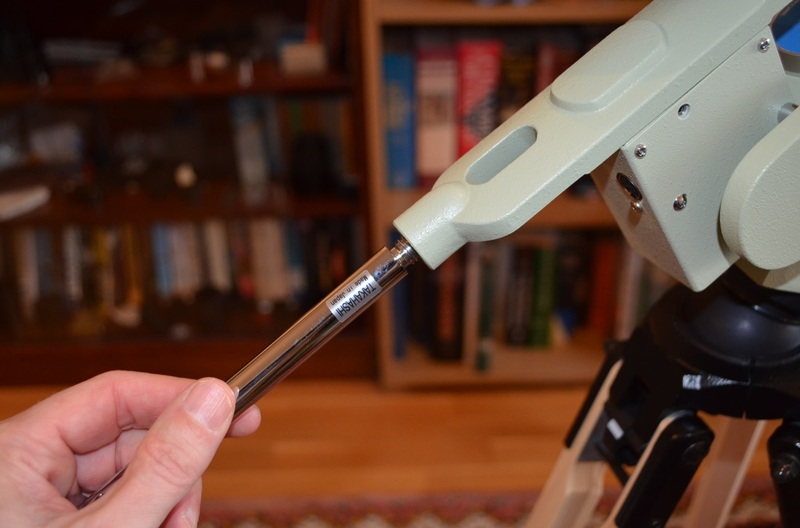 Takahashi make a table-top tripod for the Teegul, but I’ve used a small Berlebach (Report 1032) ash tripod that is light, folds-up small, looks good and damps vibration very effectively. The mount head is designed to accept the FS-60/FS-76DC 80mm tube ring and has two M6 threaded holes with the standard Takahashi spacing. However, it may be possible to get after-market accessories to allow mounting of 3rd party clamshells (I’ve seen at least one mini-dovetail accessory for the Teegul). 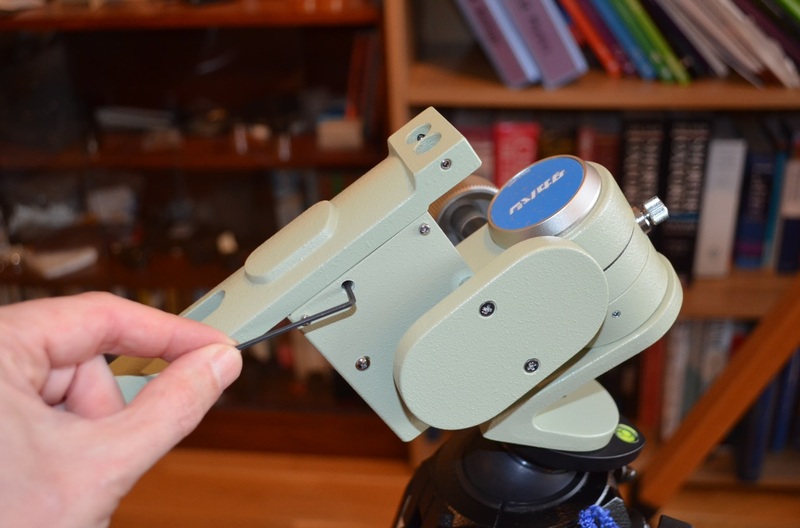 For most small refractors you would need to use the Teegul in German configuration, though, due to the limited clearance of the fork. 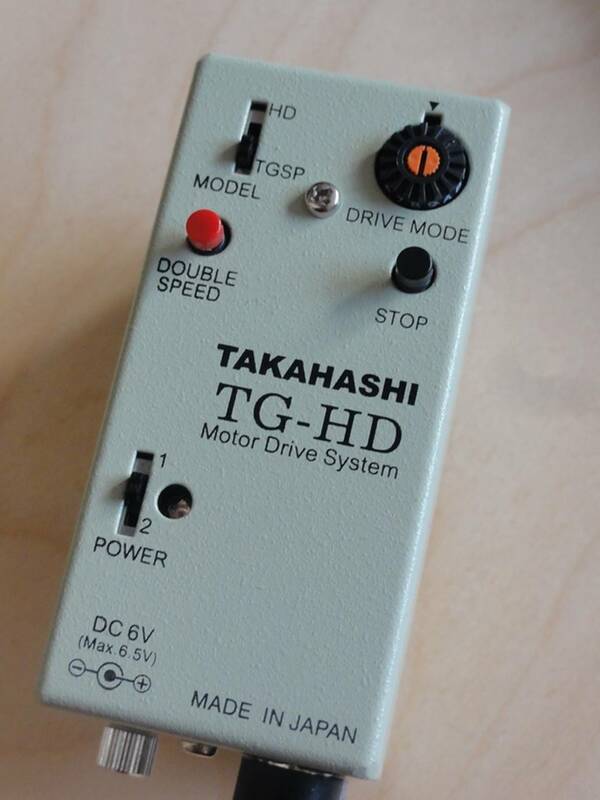 The motor has a typical Takahashi drive box that works with all three configurations described. In the SP3 variant, the control box holds the batteries (4 x AAA) and connects to the enclosed RA motor with a single DIN cable (older versions have a separate battery box). It’s also possible to connect an external 6v power supply. 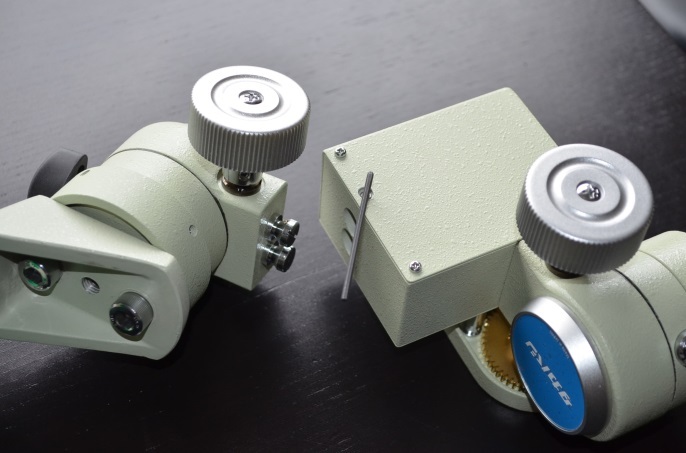 The control box is typical Takahashi: complex, fiddly and retro, but beautifully made. A photo of the box is shown below. The ‘Drive Mode’ dial gives you the choice of solar, sidereal, 0.3x, 0.5x and 0.7x rates, in either hemisphere (eclipse-chasers take note!) and double speed or stop for fine tuning your pointing. A rather bright red LED flashes when it’s running. The fork is very stable and stiff and damps vibration almost instantly with the FS-60. The slow motion controls on each axis are smooth and have in-built clutches (no need to tighten a clutch when engaging RA drive). However, this does mean the mount will drift a bit in RA until the slack is taken up after you move it with the slo-mo control. 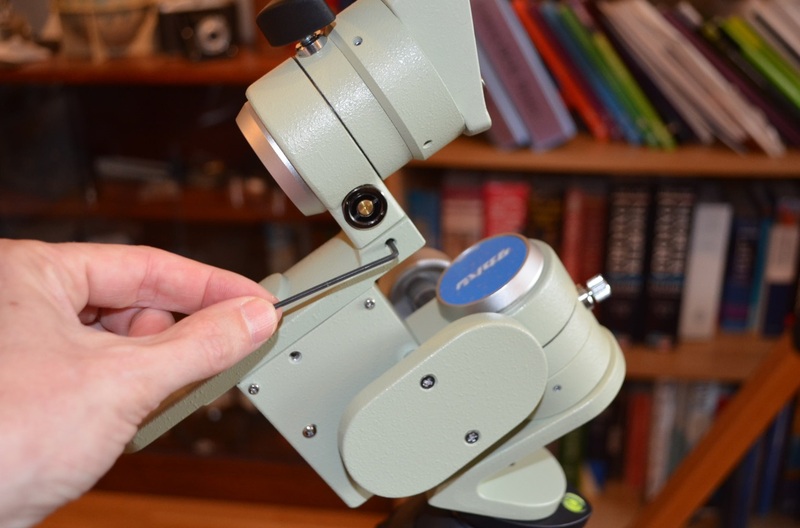 The knurled screws that tighten the axis clamps are small and fiddly – they have to be that way for clearance. Drive is quiet, smooth and effective, given that drift caveat. The single-cable control box is convenient; it’s pretty fiddly, though (the double-speed and stop buttons are miniscule). 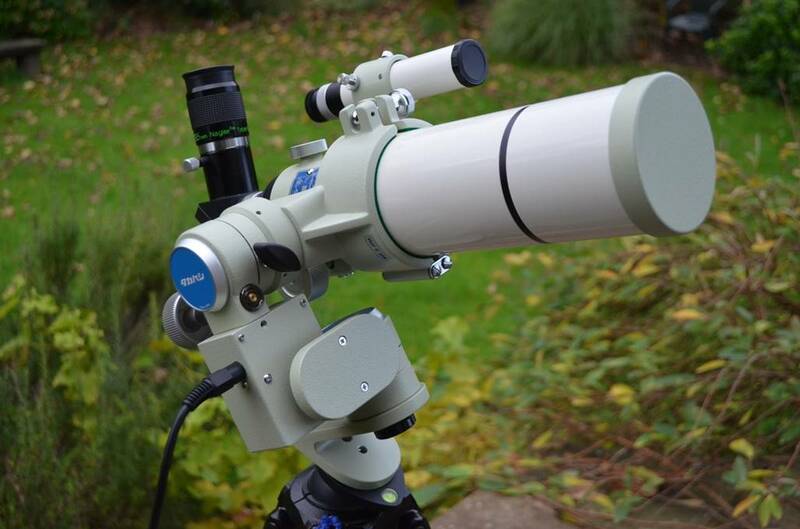 Eyeball alignment with Polaris gives very effective tracking for visual use; you’d need the German configuration and accessory polar scope for imaging. The big downside with this (fork) configuration is that viewing near to and pole-wards of the zenith is tricky due to the clearance problem. For solar system objects like the Sun, this isn’t going to be a problem. A picture speaks a thousand words and I talk enough already, so I’ve taken a photo sequence to show how to convert the mount from fork to German Equatorial. Note that a smaller DEC clamp screw is included for extra clearance. Step 2: Fit the counterweight-shaft plate onto the RA axis module. 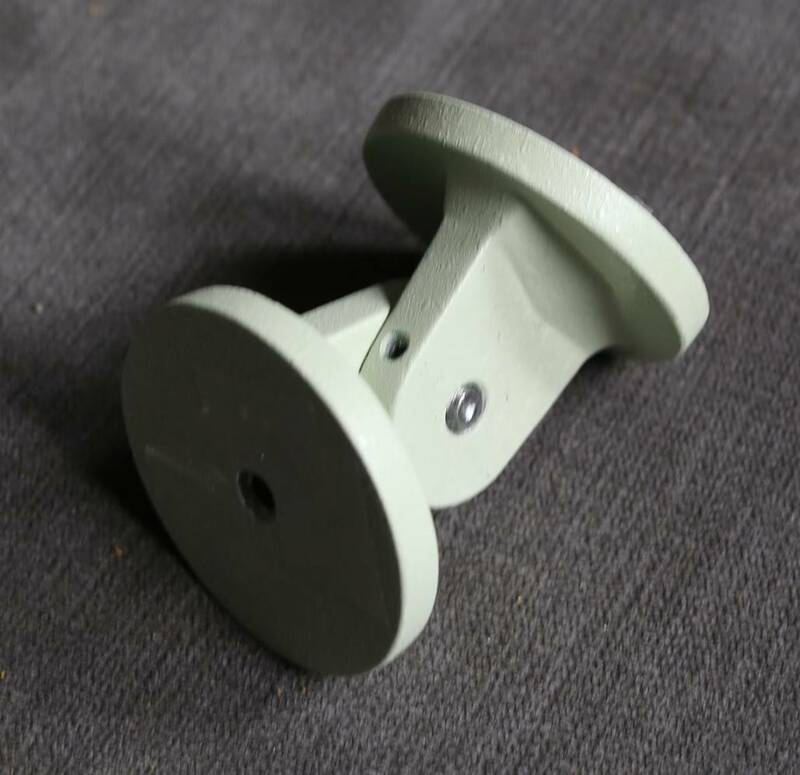 Step 7: Swap-in the smaller DEC axis clamp knob. The Teegul is highly effective in this configuration and is surprisingly stable and vibe-free for scopes in its capacity range (up to 3Kg). 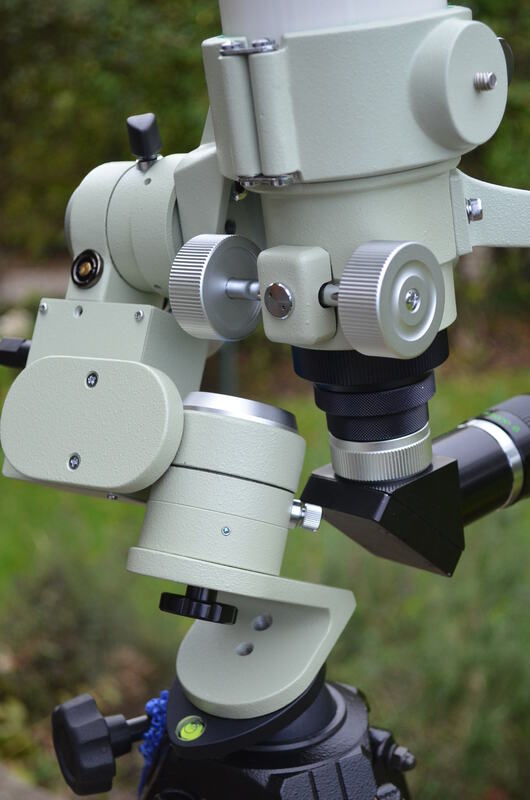 The FS-60Q shown weighs about 2Kg and is fairly long, but vibes damp very fast and planetary viewing at high magnification is possible. As you can see in the photo at the bottom of this review, the counterweight isn’t at full travel when balancing the FS-60Q, so the claim of up to 3kg seems reasonable. I’m guessing it would take the FC-76DC, but I haven’t had the chance to try it yet! If so, this would be amongst the highest-performing ultra-portable equatorial setups around (likely outperforming a Questar in most areas). 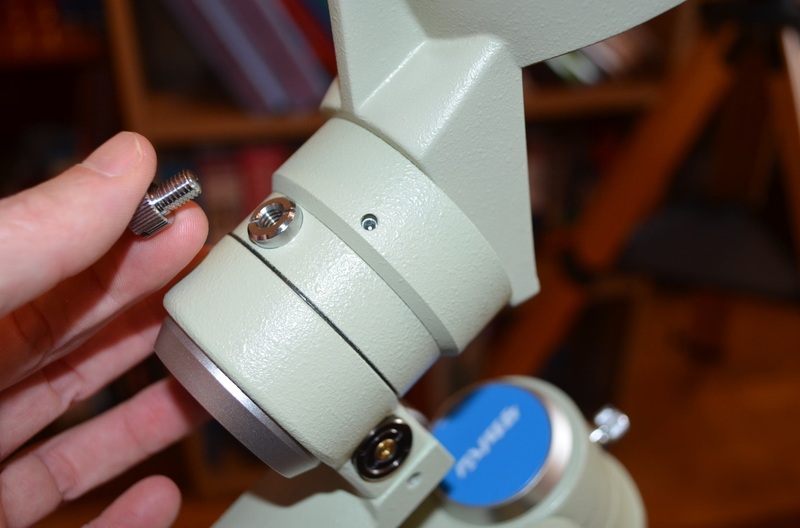 Note that the counter weight has a recess on one side so it can be pushed right over the safety screw on the end of the shaft to provide a bit more travel for a heavier scope. The whole FS-60Q setup shown in the end photo is one-hand portable and would break down to fit into a carry-on case (incl the tripod). 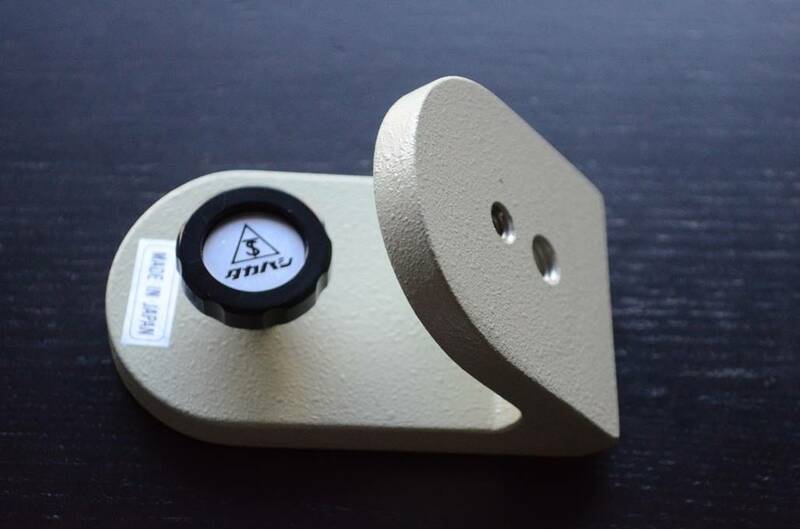 To mount the plate you have to first remove the DEC axis; the plate mounts straight onto the RA module. This configuration is designed for short focal-length (wide-angle) camera lenses only, i.e. for capturing large swathes of sky. 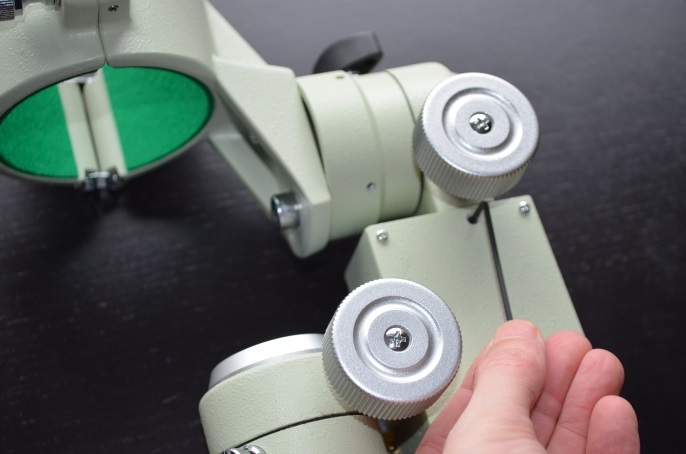 There is no DEC adjustment possible, you can just swivel the camera on its mounting-thread to point at different parts of the celestial equator. This may seem a puzzling limitation, but think about it: most of the star fields and extended nebulosity you might want to capture with a wide angle lens are near the celestial equator, right? You want to image a single DSO at higher image-scale? Use a telescope! That, at least, seems to be the rationale and it does make sense, especially given the extreme portability of this configuration (the whole mount weighs perhaps a kilo this way) – perfect for easy transport to the kind of dark site where you’ll be taking those kind of wide-angle exposures of the galactic plane. The Teegul’s highly-flexible, modular construction is far from easy to figure out at first, especially given the unhelpful Japanese instruction booklet. 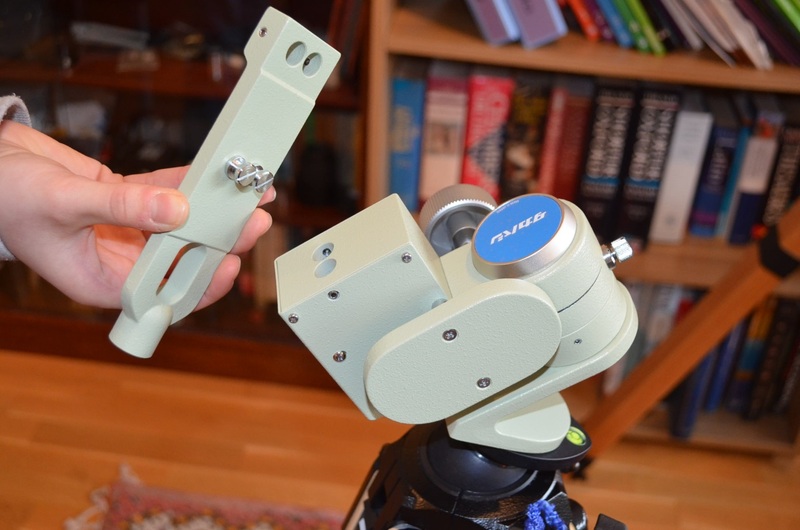 However, when you understand what it’s capable of (and have spent big on all the accessories), it’s a uniquely capable micro tracking mount for small refractors. 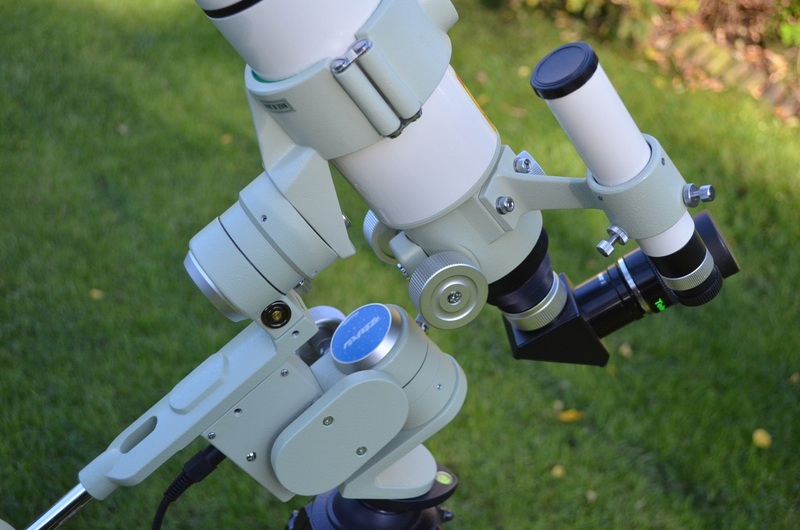 The Teegul’s small component size and light-weight, counter-weight minimising design, accurate RA drive and flexible control box, make it ideal for travel and especially for eclipse-chasers; building it up from its palm-sized components only takes about five minutes once you get the hang of it. 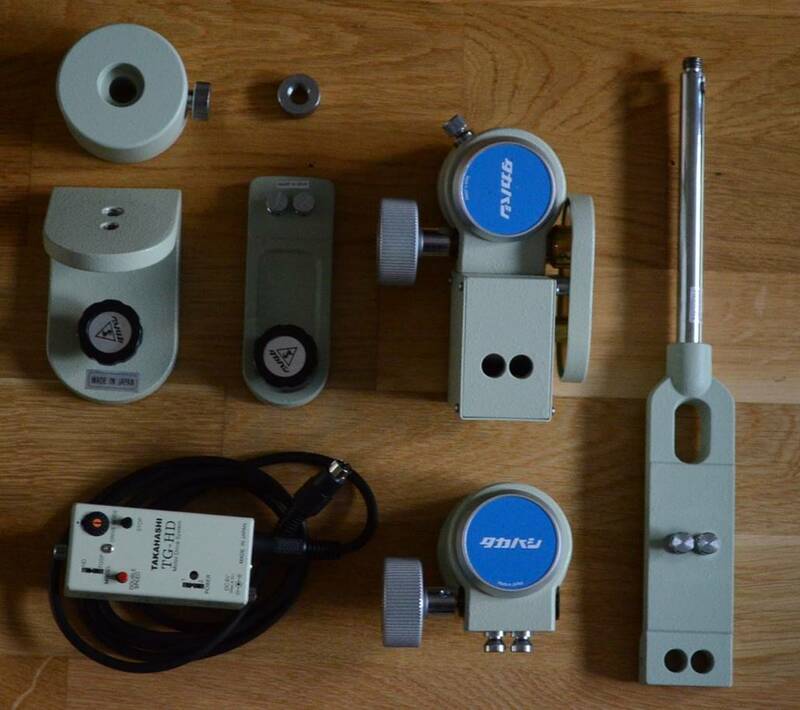 All the components would fit in a small peli-case for transport. Downsides include cost and the drift you get whilst the drive takes-up play in the clutch. 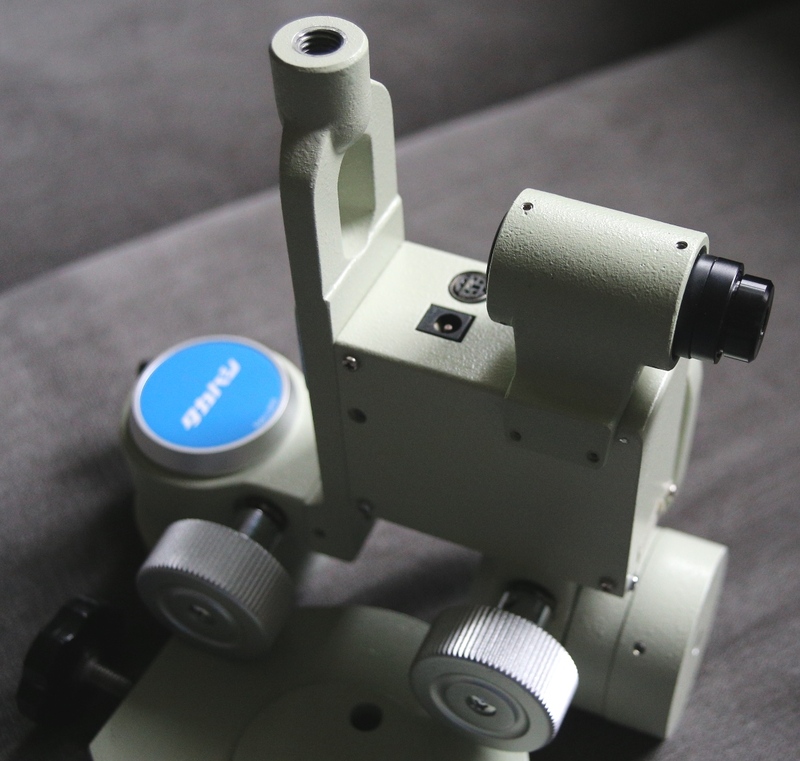 Nonetheless, I absolutely love the Teegul and find it a real improvement over an alt-azimuth mount for the kind of high-magnification observing I do. 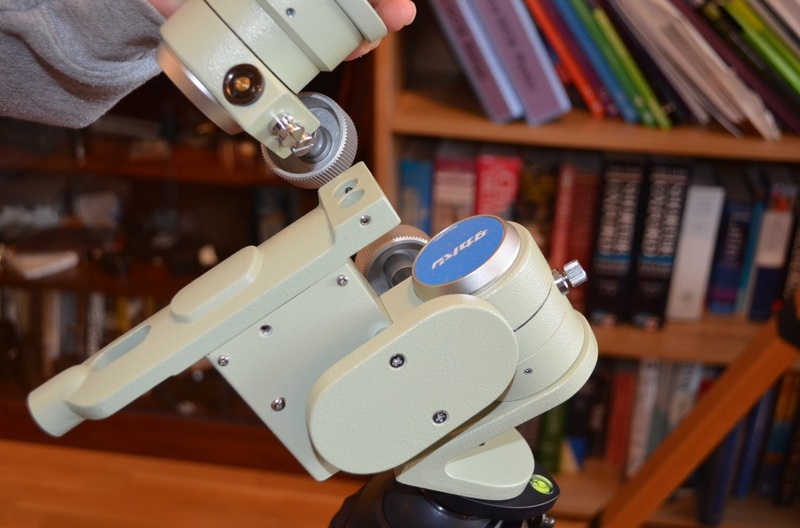 Like the Questar, you can configure a portable personal observatory around it that you can carry in one hand, but that tracks and so allows you to relax at the eyepiece. 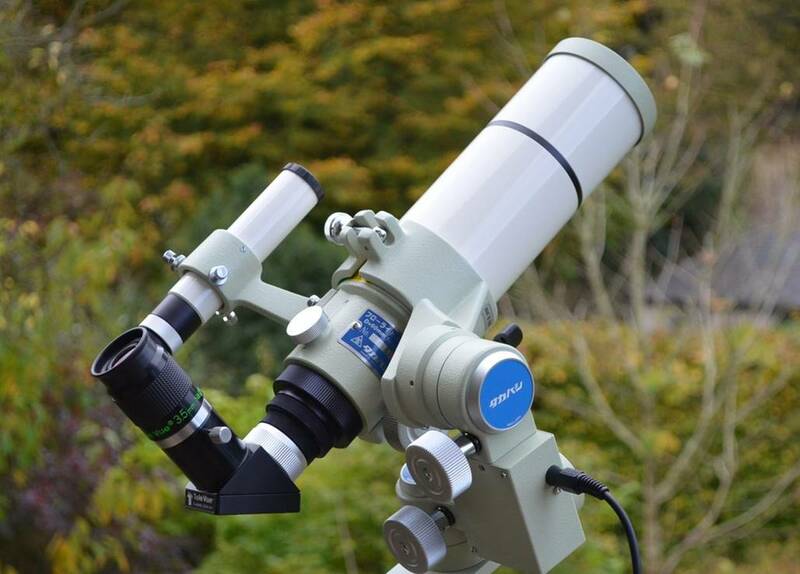 The Takahashi Teegul SP3 is highly recommended for those wanting an ultra-portable equatorial grab-no-go and for serious astro-travelers (especially eclipse-chasers). The Teegul is also attractive to fetishists of Tak’s lime-coloured castings (including me).